Welcome back to the WPlus9 December Release! My first card features the latest addition to the Punny Produce line, "Punny Produce: Peaches". 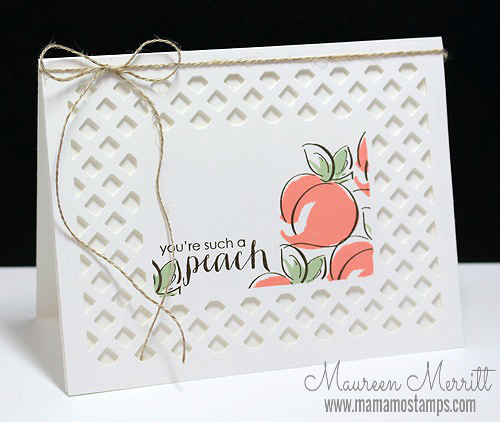 I thought these peaches would be just perfect with the Lattice Frame Die. I die cut a 4 1/4 x 5 1/2 inch piece of white card stock with the Lattice Frame die. Then I masked off the lattice and stamped the peaches in Sweet Nectar and Mojito ink. This was adhered to a white card base and tie with a simple Linen Thread bow. My next card features the Miss You Lots stamp set and die. I'll be back tomorrow for release day! See you then! Great cards, Mo! Love the first one and I think you did great coloring that little girl! So sweet! Sweet cards! Your coloring is wonderful! What a sweet image!! Yay! You went for it, and hit it out of the park!!! Love them both Maureen. Thanks so much for doing such wonderful work each release! Love both of your cards and I am very impressed with your coloring. You did the sweet image justice. Love both your cards, and your coloring is awesome!